By the 2nd anniversary of the Sandy Hook shootings, an estimated 60,000 more Americans will have died from gun violence. ST MARKS EPISCOPAL CHURCH, CAPITOL HILL, WASHINGTON D.C.
By December 11, 2016, the 2nd anniversary of the tragic Newtown shooting, an estimated 120,000 Americans will have died from guns and another 300,000 more Americans will have been injured by guns. It’s a heartbreaking toll that affects all of our communities. When the news vehicles depart, the victims, survivors and the families impacted by gun violence are often forgotten. Therefore, the Newtown Foundation together with Faiths United to Prevent Gun Violence, States United to Prevent Gun Violence, the Brady Campaign to Prevent Gun Violence, Organizing for Action, Everytown Survivor Network and Moms Demand Action for Gun Sense in America will bring families of victims and survivors of gun violence from Newtown and from around the nation—from urban, rural and suburban communities—to the 4th Annual National Vigil for All Victims of Gun Violence for a service of mourning and loving remembrance at the St Marks Episcopal Church on Capitol Hill in Washington, D.C. on December 11th at 7:00pm. The 2nd Annual National Vigil for All Victims of Gun Violence in D.C. will lead the nationwide local vigils and events across the nation to shed a light on the epidemic of gun violence plaguing our communities. 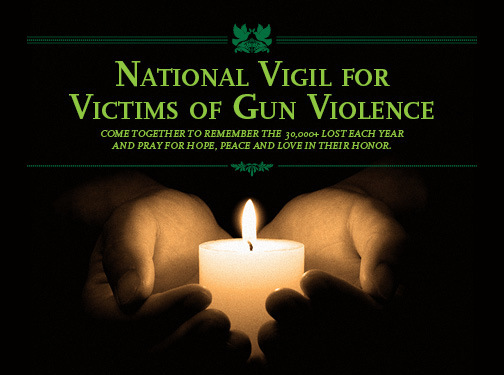 Reserve your seat at the National Vigil for All Victims of Gun Violence here. Hold a local vigil in your city or town by signing up here. Help us shine a light on this tragic toll. Join The Newtown Foundation, States United to Prevent Gun Violence, Faiths United to Prevent Gun Violence and the National Cathedral in Washington, D.C., in supporting a national vigil to honor and give voice to ALL victims and survivors of gun violence. Together we can make a difference. Together in Sorrow. Together in Action. We are asking faith organizations and gun violence prevention groups to hold concurrent vigils in each of the 50 states. Please sign up here to host a vigil in your state and we will send you a Vigil Tool Kit. What: By December 2014, the 2nd anniversary of the Newtown shootings, more than 60,000 Americans nationwide will have died from gunshot wounds. We must continue to shine a light on the epidemic of gun violence in our nation until these gun deaths are reduced. The Newtown Foundation in partnership with the Washington National Cathedral, States United to Prevent Gun Violence and Faiths United to Prevent Gun Violence will host a 2nd annual national vigil service of mourning and loving remembrance for all who have fallen victim to the ongoing epidemic of gun violence in America on December 11th in Washington D.C. -near the 2nd anniversary date of the Sandy Hook tragedy. Please join families of victims of gun violence and special guests in honoring all Americans affected by gun violence. Please attend and/or help victims’ families to attend this event by donating here. To view or submit photos to our ever-growing tribute to victims of gun violence visit https://www.newtownfoundation.org/victims-photo-upload/. Your donation to the Newtown Foundation is tax deductible.